A major exhibition of southern California baskets, “Generations of Symbols,” opens at the San Bernardino County Museum on Saturday, March 13, 2010. The exhibit, which will occupy both the Fisk and Schuiling galleries, runs through October 17. It is sponsored in part by the Morongo Band of Mission Indians. Admission to the exhibit is included in paid museum admission. More than 100 baskets will be on display, all from the collection of the Morongo Band of Mission Indians. 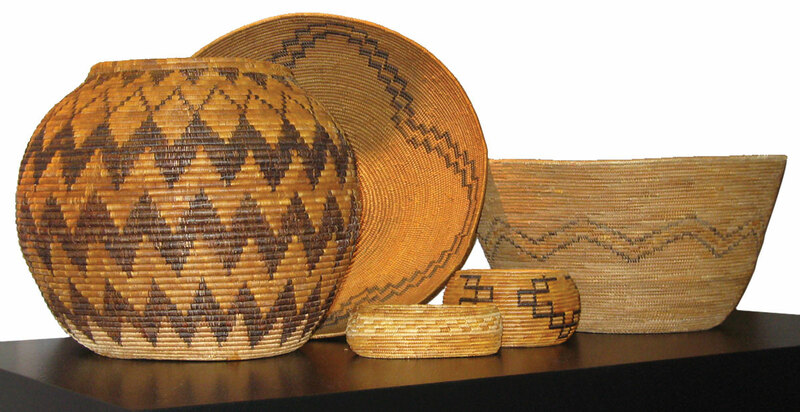 The baskets reflect several southern California basketry traditions, including Cahuilla, Cupeño, Serrano, Luiseño, and Diegueño. Baskets made by native groups in inland southern California in the late nineteenth and early twentieth century are generally identified as “Mission Indian Style.” Although the natural materials used by regional basket makers were limited compared to basket making traditions elsewhere in California and the southwest, baskets made by Native Americans in interior Southern California are remarkable for their beauty, artistic design, and craftsmanship. Set at the foot of the beautiful San Gorgonio and San Jacinto Mountains, the Morongo Indian Reservation spans more than 35,000 acres and overlooks the vistas of the Banning Pass. Its elevations range from approximately 1,400 feet to 6,274 feet above sea level. The reservation lies within traditional Cahuilla territory, and more specifically, the territory of the Pass Cahuilla people. The place name for this area is Malki. Established in 1876 under Executive Order, Morongo was one of nine small reservations set aside by President Grant. Originally named Potrero Ajenio, the reservation was only 640 acres in size. Over the coming years, the boundaries would change many times before arriving at the present land base. By the mid-nineteenth century, the Serrano people to the north began migrating to the Potrero Reservation settlement. They brought with them the Morongo name derived from the Serrano word Marringa’, which means the people of Marra’ (the Serrano place of origin). Since the late nineteenth century, individual families representing several tribes, or tribal groups, have come to settle on the reservation. Mostly, these families are descendants of Cahuilla or Serrano Lineages; however, there are also families with ancestral ties to Cupeño, Luiseño, Chemehuevi, Paiute and Kumeyaay groups. The Morongo tribe continues to invest and protect the traditional customs and collections to ensure the continuance of the cultural heritage for this generation and for generations to come. Over the past decade, Morongo has been acquiring and bringing home sets of Southern California Mission baskets. 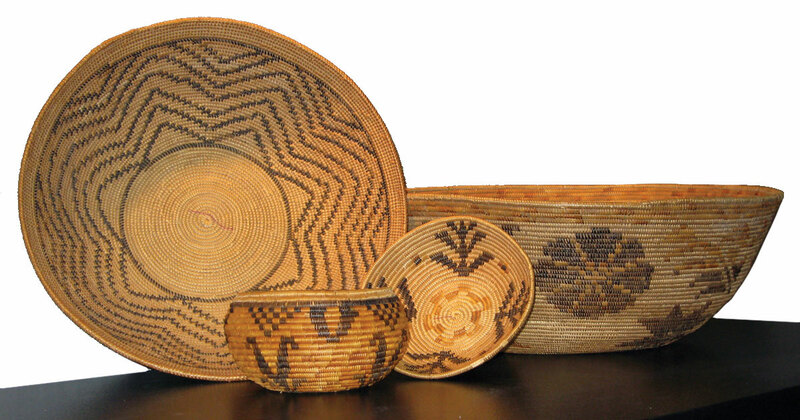 The Morongo Basket Collection has been cared for and preserved with the assistance of the San Bernardino County Museum. The history and techniques of Mission Indian Style baskets are discussed in a publication written by David D. Earle and published as a Museum Association Quarterly called “Coiled Baskets from the Morongo Collection.” This full-color publication, based on the exhibit, will be available for purchase in the Museum Store. The San Bernardino County Museum is at the California Street exit from Interstate 10 in Redlands. The museum is open Tuesdays through Sundays from 9 am to 5pm. General admission is $8 (adult), $6 (military or senior), $5 (student), and $4 (child aged 5 to 12). Children under five and Museum Association members are admitted free. Parking is free. For more information, visit www.sbcountymuseum.org.